You Dan Brown fans out there have been sleeping on the job. 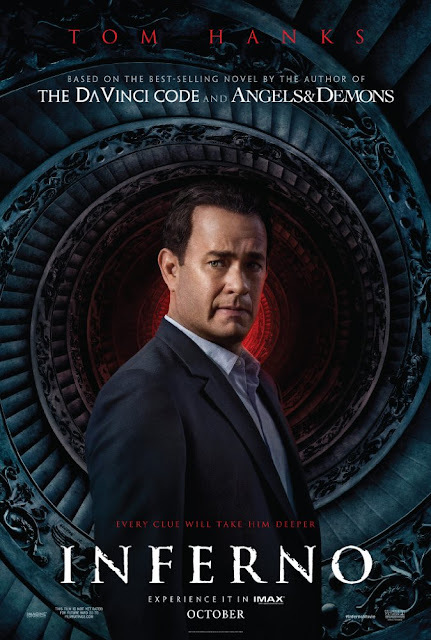 The trailer for Inferno, based on the fourth installment of the Robert Langdon series hit the web last week without a peep from any of you. I'm slotting the film into its rightful place—October 28th—in the guide to Movies based on Books 2016. Dr. Sienna Brooks is played by Felicity Jones who absolutely shimmered in The Theory of Everything. The film also stars Ben Foster as Bertrand Zobrist, an eccentric billionaire who creates a plague Langdon needs to prevent and Omar Sy as one of the good guys, Christoph Bruder, head of the SRS team. Let's check out the trailer. The Da Vinci Code remains a tough act to follow but taken on its own merits, do you think Inferno could be a worthy follow up? It appears to be a fast paced thriller, full of action and some exciting special effects. The fourth Langdon film, based on The Lost Symbol, the third in Dan Brown's Langdon series has also been announced. Are you in?